Imagine how much easier it would be if you could integrate Zoho Books with other online apps you use on a daily basis. How about sending an SMS to your customer once the invoice has been created or getting a notification when a new Contact is added? The list never ends. Does it? Now visualise a scenario where all this gets done automatically in your Zoho Books account. No complicated codes, no manual keying in, just connect your Zoho Books account to all the apps that you know are key to running your business. Excited already? Because we sure are. 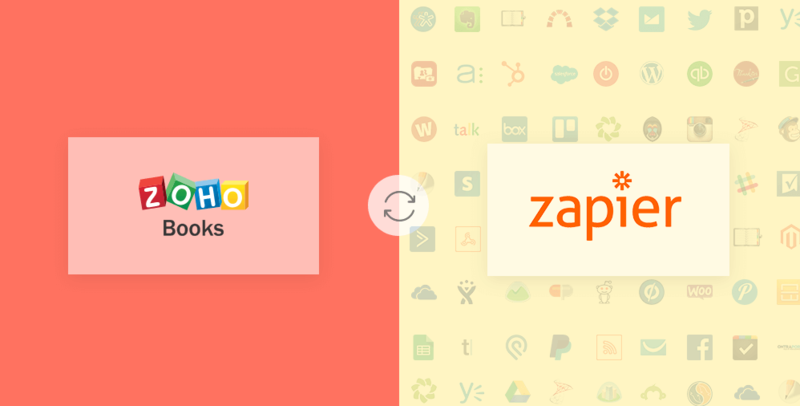 We are more than delighted to announce that Zoho Books has been added to the Zapier platform, a web-based service that provides better, faster connections to the apps you use every day. With this new integration, redefine the way you run your business by automating tasks performed by any of the apps in Zapier’s network of 500+ third-party applications. The real advantage of this integration lies in the fact that you don’t need to know anything about coding to make this automation possible. Zapier works on a ‘trigger – action ‘ structure. For example, you withdraw money from an ATM and you immediately receive an SMS on your phone informing you about the withdrawal. In this case, withdrawal is the trigger and the SMS is the action for the trigger. Now applying this in Zoho Books, say you have created a new Contact in your Zoho Books account and you need to add this new Contact as a subscriber in your MailChimp account. Wondering how to do it? Simple, you create a Zap. 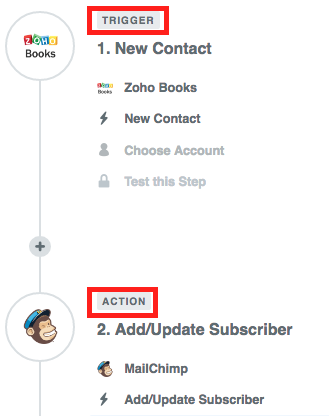 Setting new Contact as the trigger and add/update Subscriber as the action for this trigger, would automatically add the contact as a subscriber in your MailChimp account every time a new contact is created. The new Zapier integration lets you increase the scope of Zoho Books by enhancing connections with third-party apps that suit your business needs. Unlock information in Zoho Books and integrate it with other apps for more streamlined workflows and better business processes. Head over to your Zoho Books account and check out the new Integration to experience the possibilities it holds. If you have any questions, write to us at support@zohobooks.com. Make expensing easy with Email Receipts!